When we truly find the knowledge of Christ there is a calm from the chaos which we were such a part of and had sadly gotten used to. There really is a peace which passes all understanding. (Philippians 4:6-7). Be careful for nothing; but in every thing by prayer and supplication with thanksgiving let your requests be made known unto God. 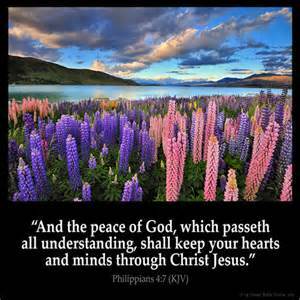 And the peace of God, which passeth all understanding, shall keep your hearts and minds through Christ Jesus. As Christians we are to walk in the spirit given us of God, therefore the spirit of the world known as the flesh will not have any part in inheriting heaven. We must be led by the spirit and know what the fruit of the spirit is so that we may follow it. (Galatians 5:16-24) This I say then, Walk in the Spirit, and ye shall not fulfil the lust of the flesh. For the flesh lusteth against the Spirit, and the Spirit against the flesh: and these are contrary the one to the other: so that ye cannot do the things that ye would. But if ye be led of the Spirit, ye are not under the law. Now the works of the flesh are manifest, which are these; Adultery, fornication, uncleanness, lasciviousness, Idolatry, witchcraft, hatred, variance, emulations, wrath, strife, seditions, heresies, Envyings, murders, drunkenness, revellings, and such like: of the which I tell you before, as I have also told you in time past, that they which do such things shall not inherit the kingdom of God. But the fruit of the Spirit is love, joy, peace, longsuffering, gentleness, goodness, faith, Meekness, temperance: against such there is no law. And they that are Christ’s have crucified the flesh with the affections and lusts….. (Hebrews 12:14). That is such a beautiful picture and passage 🙂 Thanks for sharing!